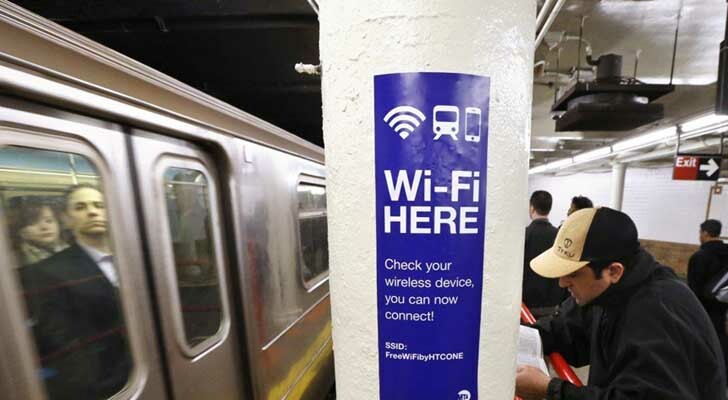 File photo: A sign advertises Wi-Fi service in the Times Square Subway station in New York, April 25, 2013. Slow Wi-Fi is the worst. Your email won’t refresh. Your movie freezes mid-scene. Your new app is stuck in downloading limbo. You see that apologetic little message about how your browser “timed out” and you should “try again later.” Gee, thanks for that. Many people just wait. Wi-Fi is moody, they think. Just give it time. Often the issues linger for days, even weeks. In this case, the culprit could be the router itself. If you have not updated the firmware in your router, hopefully a hacker hasn’t taken root. Attacks using routers are on the increase. Don’t let your router be one of them. Then, try these three simple tweaks to stop the buffering. [post_ads]First off, you have to get into your router’s “administration console.” This may sound intimidating, but the console is where you manage your router’s settings. You find this console using your computer, tablet or phone. Where do you find your IP address? Once you have that number, type it into the browser. You’ll be prompted for a username and password. If you have not changed the default credentials, I suggest you do that now. Someone nearby may be using your router without your permission and this might explain why your connection has been slow. Look for a section called “Wireless Settings” or “Advanced Wireless Settings.” Here’s where the magic happens. Wi-Fi routers come in all varieties, and their signals vary. A new router should at least support 801.11n, also known as “N routers.” These devices are theoretically capable of speeds up to 600 Mbps, which is much faster than older 801.11g models and should keep up with your internet needs. The past few years, an even faster protocol, 801.11ac, has become the standard. AC routers have theoretical speeds of up to 4.5 Gbps and have newer technologies like beamforming and the utilization of eight streams, a significant step up from N routers. Speaking of bands, newer routers usually have multiple band capabilities. By utilizing dual or even triple bands, you can keep older devices that support only the slower G specification on the 2.4GHz band and newer N or AC devices on the beefier and speedier 5GHz band. This is essentially like having multiple routers in one. It’s a good idea to separate G, N and AC gadgets, since mixed mode routers usually are slower and the 2.4 GHz band used by G gadgets is congested. Some AC routers even have triple bands that let you separate G, N and AC gadgets on your network. Knowing all this, if your router is a few years old, it’s probably time to buy a new one. Next step is to select your router’s channel, especially if you're on the 2.4GHz frequency, the standard frequency for G gadgets. [post_ads]This 2.4Ghz band is particularly congested because, aside from other Wi-Fi routers in your vicinity, devices like cordless phones, Bluetooth speakers, microwave ovens and baby monitors occupy this band. This overload causes interference, slowdowns and unpredictable connectivity. Moving from one channel to a less crowded one may help speed things up and provide more reliable connections. But how do you pick another channel? What is the difference between one channel and another? To answer these questions, you’ll have to use your Wi-Fi scanner. For Macs, Apple provides a free tool called “Wireless Diagnostics.” To get to it, hold the Option key while clicking on the Wi-Fi icon on the right-hand side of the menu bar, then choose “Open Wireless Diagnostics.” To access the Scan tool, ignore the actual Wireless Diagnostics window, then go to the Window tab on the top left side of the menu bar and choose Scan. You will see a list of all the Wi-Fi signals in your vicinity and the channels they occupy. For Windows, download the free Wi-Fi utility, Acrylic Wi-Fi Home. Similar to Mac’s Scan tool, this application will instantly give you information about the Wi-Fi signals in your area, including the channels they utilize. The software will even give you ratings based on Channel Quality, Signal Quality, Signal to Noise, Security and Speed. Another Windows tool, Vistumbler, has similar capabilities. For Android users, there are many different Wi-Fi scanning tools available. A very popular one is Network Analyzer. Once you have the channel info you need, I recommend channels 1, 6 and 11, since they don’t overlap with each other. Just choose the one among these that is least crowded and evaluate your improvements. Switching channels sometimes requires some trial and error. As I tell people over and over again, security is very important, especially with routers. But it’s not just having any security; it’s the type of security you select. Believe it or not, this can affect the speed of your connection as well. For starters, if your network is Open (no security) or you’re using WEP, change the security settings immediately. This lack of security leaves your network completely exposed. You also don’t want WPA or TKIP, options you will probably see in your settings. Instead, select WPA2 with AES. AES is newer and more secure, and you can use it to achieve top speeds on your N router. After you do all this, give yourself a pat on the back. You’re on your way to becoming a networking pro! How else can you make your home network more efficient? Be sure to listen to or download my podcasts, or click here to find it on your local radio station. You can listen to the Kim Komando Show on your phone, tablet or computer. From buying advice to digital life issues, click here for my free podcasts.